A recent white paper from ESS focuses on the growing need to combine energy and power applications into a single flexible and valuable long-duration storage asset. What makes long duration storage, such as microgrid energy storage, so attractive is its availability to capture a wider range of use cases and potential revenue streams. Long Duration Storage Beyond Four Hours. Download the white paper now. The white paper from ESS is based on a combination of online questionnaires and in-depth discussions. ESS worked with Energy Storage Report to conduct the research. Energy storage technologies and applications have always been defined by two essential factors: rating and duration. The report makes the case that all-iron flow batteries can meet the requirements that developers have for a long-duration storage asset that is safe, low-cost, and flexible today and into the future. ESS explores new technologies for longer duration energy storage, which according to research respondents must be capable of at least four hours of storage or more. 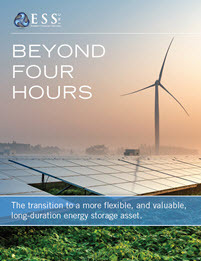 Almost all of the utilities and grid-scale energy project developers surveyed for the white paper agree that there is a growing need for long-duration storage, with approximately one in three seeing it as very important to their current business models. ESS looks into the biggest drivers of value in energy storage projects, one of which is the ability to stack several applications onto a single flexible, and long operating-life asset. The paper also covers the current concerns about implementing long-duration storage, some of the largest of which relate to uncertainties about costs, both upfront and levelized, and technology bankability. Some companies even think that since the long-duration storage market is still maturing, it might be better to wait a few years to get involved. But returns on investment from long-duration storage could be worth the supposed risk. The white paper outlines the top applications for long-duration storage that respondents say currently offer the greatest potential for a return on investment. These range from self-consumption for renewable energy to backup power in the event of grid failure, and more. ESS contends long duration storage is the best, most economic hedge against the inevitable changes that are coming in the regulatory, legislative, and economic landscape. For more on the possibilities of long-duration storage and the trends on the horizon in this market over the next 12 months, see the full white paper. Hello,I read your blog named “Long Duration Storage Covers Range of Use Cases, Revenue Streams” daily.Your humoristic style is awesome, keep doing what you’re doing! And you can look our website about اغانى عربية.